Born, raised and planted – Christie Puckett describes her lifetime of living in Maysville, Okla., this way. 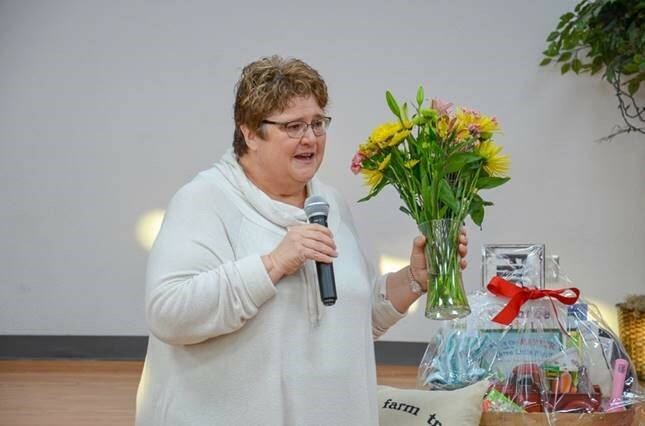 Puckett, who has taught at Maysville Public Schools for her entire 34-year teaching career, has been selected as the 2019 Oklahoma Ag in the Classroom Teacher of the Year. She has pursued AITC in many ways, to include attending countless workshops, tours and conferences across the state. She shared her skills with other educators at the 2016 AITC State Summer Conference as a presenter. Last year she was an AITC Teacher of the Year finalist and attended the National AITC Conference in Maine. Although her accomplishments attest to her dedication, it all starts in the classroom. Puckett has incorporated agricultural lessons into her classes since she began teaching. This passion also led Puckett to become a 4-H leader. She says her AITC lessons always keep her students actively engaged and learning. Puckett has taught performing arts, kindergarten, first, third, fourth, fifth and sixth grades, as well as seventh and eighth grade English. However, now she teaches fourth, fifth and sixth grade science. Outside of her own classroom, Puckett continues to incorporate AITC. The first Thursday of every month, she reads an agriculture-related book to all elementary students. The students then visit her science lab for a lesson on the book’s subject. The past few years, she has also incorporated an “Ag Day” at Maysville Elementary School. With help from the local ag teacher, community members, former students and other guests, Puckett spends months planning the event to ensure its success. Dr. Shelly H-Beach, Maysville Public Schools superintendent, commented on the event as well. Puckett is impacting all students in her community, and it does not go unnoticed. Christie Puckett will be honored at the state Capitol in Oklahoma City as part of the state’s annual Oklahoma Ag Day celebration April 2. Teachers and students from across the state will be recognized as winners of the 2019 AITC “Oklahoma Ag Adventure” contest. This celebration is open to the public and is free. Sponsors for Ag Day include the Oklahoma Beef Council, Oklahoma AgCredit, Oklahoma Farm Bureau Women, Oklahoma Soybean Board, Dairy MAX, Southwest Dairy Farmers and ODAFF. Puckett will attend the National AITC Conference June 18-21, 2019, in Little Rock, Arkansas. The 2019 Oklahoma AITC Teacher of the Year Finalists are as follows: Early Childhood, Anna Wofford from Frederick Elementary School in Frederick; Elementary, Megan Plummer from Holmes Park Elementary School in Sapulpa; Middle School, Dusti McCartney from Willard 5th and 6th Grade Center in Ada, and High School, Tammy Will from Morrison High School in Morrison. These finalists will also be attending the National AITC Conference in Arkansas. The Oklahoma AITC Teacher of the Year and the finalists are able to attend the national AITC conference because of the sponsorship of Oklahoma AgCredit. This summer, Puckett will also be on the road with Oklahoma AITC June 4-6 touring “Ag on Route 66.” Teachers from across the state travel Oklahoma from Kellyville to El Reno to learn more about agriculture by touring farms, ranches and more. To learn more about Ag in the Classroom curriculum, visit www.agclassroom.org/ok or contact Audrey Harmon, an Oklahoma AITC coordinator, at (405) 740-0160 or audrey.harmon@ag.ok.gov.